OMG, OMG, OMG. This dish was phenomenal, and I can’t believe it’s taken me this long to post about it. It’s probably been a month now since I made this, and it was delicious. 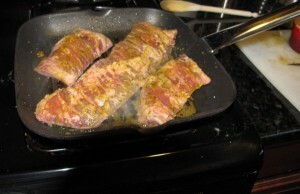 It was in the June Gourmet‘s “Every Day Quick Kitchen” section, one of their 30 minute recipes. It really was that fast, and it was tender and so flavorful. I couldn’t get my hands on hanger steak when I made it, so I used skirt steak on the butcher’s recommendation and loved it. The chutney is the ultimate summer greatness, so I’m thinking I may need to make this again in the next few days to take advantage of the heat and the melons. The recipe calls for cooking it on a grill, but I used my grill pan inside and again, this was fine. I made the Toasted Orzo with Saffron and Fennel from that same issue as an accompaniment (that’s it on the dish next to the steak). Honestly, I wasn’t wild about it. I can’t remember now why that was exactly, I either undercooked the orzo or just didn’t quite like the flavors in the dish. But I’ll add the text for that recipe at the bottom of this post for anyone who wants to try it. 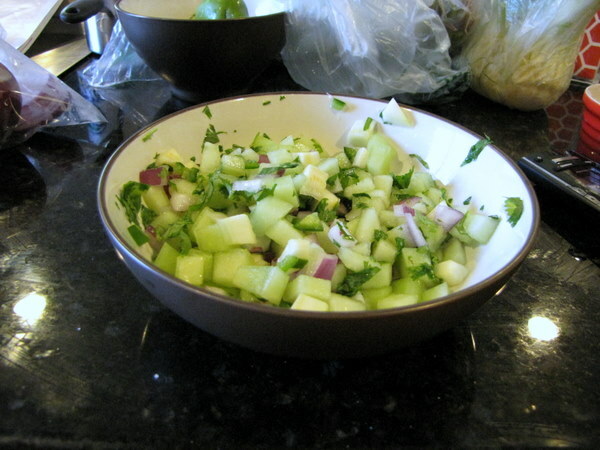 Make the chutney: Stir together honeydew, cucumber, onion, lime juice, cilantro, jalapeno, and 1/4 tsp salt. Sprinkle with the spices and let the chutney stand while grilling the steak. Grill the steak: Prepare a gas grill for direct-heat cooking over medium heat (I just oiled my grill pan and turned the burner on to medium). Stir the lime juice, oil, curry powder, 2 tsp salt, and 1 tsp pepper together in a bowl. 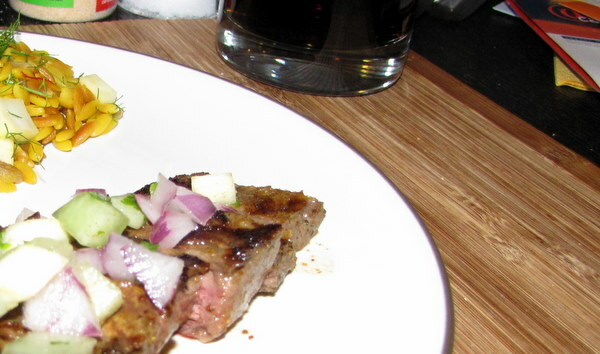 Coat steak with the curry mixture. For outdoor grill: Oil the grill rack and then grill the steak, covered, turning once, 9 minutes total for medium-rare. 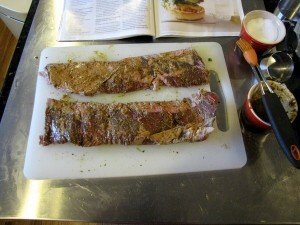 Let rest on a cutting board 5 minutes, then slice thinly across the grain. Serve with chutney. My version: Oil your grill pan lightly (make sure it’s set to medium heat). Grill the steak uncovered for 9-10 minutes, turning once for medium rare. Check it to make sure it has cooked through to the temperature you’re after. Let it rest, slice it, and serve it with the chutney. Soften saffron in 1 Tbsp hot water and set aside. Cook onion in oil in a 3-qt saucepan over medium heat, stirring occasionally, until softened, about 6 minutes. Add orzo and toast, stirring frequently, until fragrant (2-4 minutes). Stir in saffron mixture, remaining 2 cups of water, and 1 tsp salt and simmer, covered, until orzo is tender and the liquid is absorbed, about 12 minutes. Sprinkle fennel bulb over orzo and let stand, covered, off heat for 5 minutes. Stir fennel bulb into orzo and sprinkle with fennel fronds. Serve.